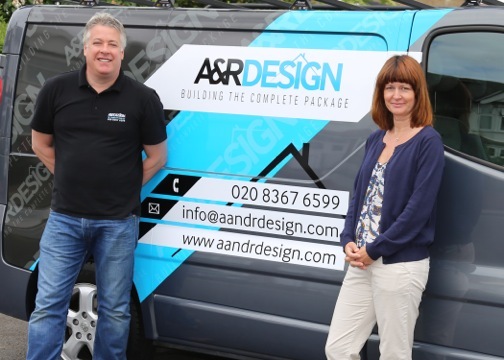 business back in 1996, building on the experience we both already had in design and decoration, to offer a high quality service to our clients, encompassing all aspects of property refurbishment and renovation – see what we do. This original ethos remains at the heart of our business, and we have built on these firm foundations and have gone from strength to strength, by offering only the highest quality service and craftsmanship to all our customers. We are now a well-established firm, with over 40 years’ combined experience in all aspects of the trade, and we work with a hand-picked team of 30 trusted and fully accredited professionals, each with extensive specialist expertise. We are based in Enfield, North London, and cover a 20 mile radius including London, Essex and Hertfordshire. We at A&R Design firmly believe that word of mouth is the best advertising a business can get and the very fact that over 85% of our custom comes from referrals proves to us that we are doing our job right. We have an excellent success rate for finishing our work to the highest standards, on time and within agreed budgets, and we are happy to provide you with references from our previous clients. We also offer the added reassurance of our Peace of Mind Promise. We pride ourselves on the fact that we are considerate (ensuring minimal disruption to your family life whilst our work is going on), organised (we manage all aspects of the project for you) and have excellent attention to detail, ensuring the highest quality finish.